Good hydration is essential when sailing. Whether coastal or recreational sailing, sailing on the open seas or long-distance sailing, or even sailing competitions or sports regattas, your body’s water requirements on board a ship will be higher than when resting or on dry land. Keeping well hydrated while sailing is important for physical and intellectual performance, so it must be taken seriously from the start. Why do we lose more water when we sail? The food we eat: If, depending on the type of sailing we undertake, we consume more dehydrated or freeze-dried foods, we reduce our water intake that we usually ingest through food, which, under normal conditions, represents about 30% of our total hydration. The physical exercise we perform: In competitions or regattas, sailors are usually fully aware of the physical exercise that it entails. But recreational sailing, or even repairing a boat, requires extra physical exertion. Environmental conditions: The outside temperature and the level of humidity also play a role, although in different ways. A higher temperature will make us sweat and increase water loss through the skin. In dry climates and with the effect of the wind, the sweat dries on the skin and helps us to thermoregulate, but it also prevents us from feeling the heat as we otherwise would in humid or windless conditions, which would make us drink more. Therefore, when we sail we may lose water without even realising it, or have no obvious symptoms until it becomes a problem. 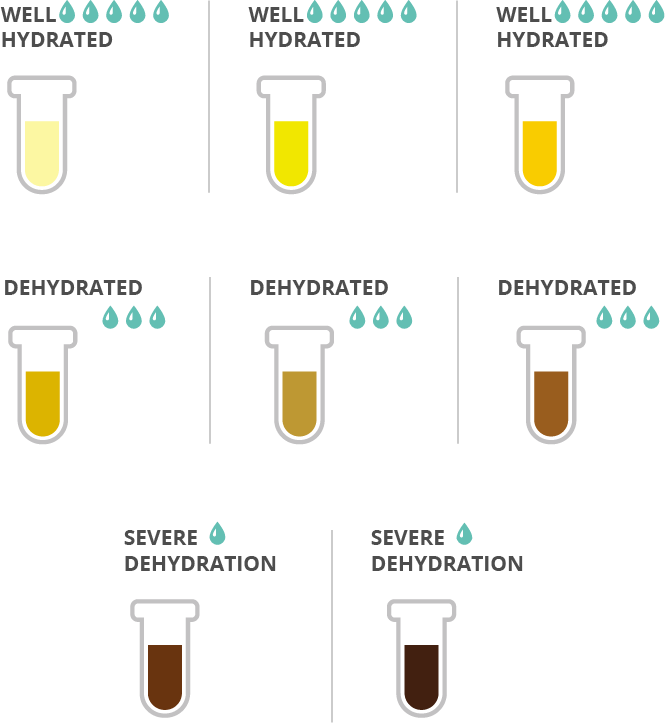 The colour of your urine is a good indicator of your body’s level of hydration. The more transparent, the better hydrated you are; Conversely, you probably need to take on fluids urgently if your urine is darker than normal. We must bear in mind that some foods or vitamin supplements, such as beetroot, iron or vitamin B12, can alter the colour of urine, but only while these substances are being removed from the body and not permanently. However, if you think that the colour of your urine may be indicative of severe dehydration, it is best to go to the doctor to rule out other causes. As we have said, the first thing we have to keep in mind is to try to stay hydrated from the beginning. If you expect to undertake extra physical exertion and will perhaps not be able to drink as much as you should during this time, it is best to increase your water intake before the activity and assess how much you have lost afterwards to replace it. As a guideline, if you have lost fewer than two kilos of weight, you can recover by ingesting your usual amount of water. On the other hand, if you have lost more than two kilos, the American Dietetic Association recommends drinking 450-700 ml of fresh water per 500 g of weight loss, and you should drink even if you are not thirsty. In this case, it is also recommended to eat slightly salty food or olives to increase the amount of potassium. During physical activity, it is best to drink water regularly, between 150 ml and 300 ml every 15 or 30 minutes. If possible, it should be slightly chilled, between 15ºC and 21ºC. And above all, do not forget to continue hydrating after concluding your physical activity. Although not the central theme of this article, it is important to note the importance of water quality on a boat. Having an adequate supply of drinking water on board is essential in order to meet our hydration needs, depending on the type of sailing being undertaken, the environmental conditions and the climate, as well as the physical exertion required. In addition, water quality is essential to avoid diseases and gastrointestinal disorders. The World Health Organisation (WHO) provides guidelines for drinking-water quality, but more practical nowadays is to have a desalination system on board to provide a constant supply of fresh drinking water without the risks associated with traditional storage, such as the water being contaminated by bacteria or chemical products, or not having stored enough. Sources: Alimentación y dietética para una vuelta al mundo a vela [Food and dietetics for round-the-world sailing], Universitat de Barcelona & Fundació Navegació Oceànica Barcelona; Guidelines for drinking-water quality, World Health Organisation; Guía de sanidad a bordo [Guide to ship sanitation], Pan American Health Organization. How much water do we need on board a boat? Are you ready for ARC 2018? We’re on the way!